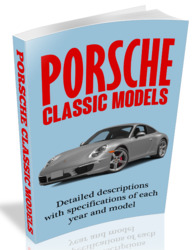 From 1987 models on*, the front brake caliper piston diameters were changed to 44/36 mm (previously 42/36 mm). During the 1989 model year, a further modification was introduced. 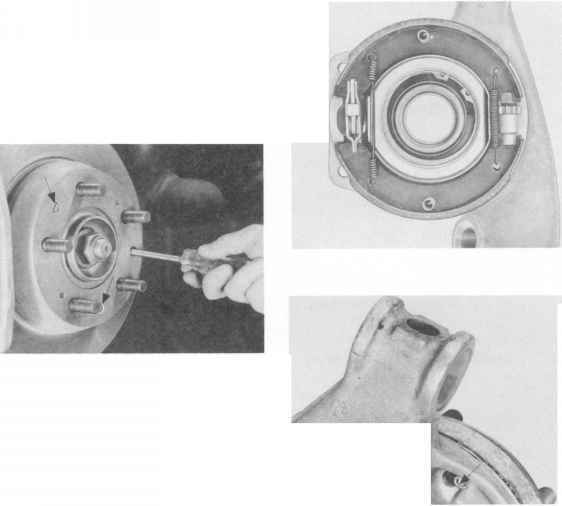 The piston seal was changed from the scraper ring type to the protective cap type. (Technical Information Gr. 4 No. 1/89) Notes on replacement: refer to Pages 47-04 / 47-05. * On some cars (those for the USA, Canada, Australia and Arab countries), fixed calipers with piston diameters of 42/36 mm were still used in the 1987 model year. For notes on replacement, refer to Page 47-04. 4. Installing new damper plates in the pistons. When installing, make sure that the internal diameters of the spring and piston are correctly matched together (Technical Information Gr. 4 and Part List). The damper plates should engage in the pistons when light pressure is applied, but must not be too ioose (no radial play is permissible). 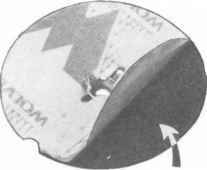 The damper plates are provided with an adhesive and protective foil. The protective foil must be pulled off before installation. 5. Insert the brake pads. Make sure that the correct grade of brake pad is used. When damper plates are installed, the brake carrier plates (back of brake pads) must not be greased. 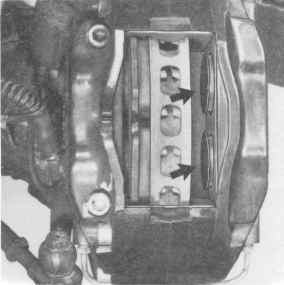 However, to prevent the brake pads from corroding and seizing in the brake caliper, the seat and guide faces (arrows A) are given a thin film of grease. Use Optimoly HT (Cu paste) or Plastilube (Schillings Co., P.O. Box 1703, 7080 Aalen, Federal Republic of Germany) for this purpose. 6. Grease the spreader spring retaining lugs with Optimoly TA or Plastilube. If new spreader springs are installed, the flat side should face the brake disk, if wrongly installed," correct brake pad seating cannot be guaranteed and the raised section in the center of the cross will rub against the brake disk. Press the spreader spring together in the center and insert it. 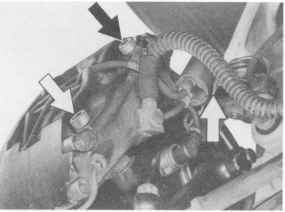 Make sure that spreader springs engage correctly (arrow). Do not force the spreader spring into position or the retaining plate may be damaged. 7. Press the warning contact(s) into the pad plate in the correct positions. Secure the warning contact lead to the brake caliper and, if two warning contact leads are present (from 1989 models on), to the cross spring as well. If tolerances are unfavorable, the spreader spring may have to be disengaged again to do this. 8. With the car standing still, depress the brake pedal firmly several times, so that the brake pads adopt a position ready for later operation. After this, check brake fluid level in the reservoir and add more fluid if necessary. New brake pads need to be used for about 200 kilometers before they develop their optimum friction and wear characteristics. During this time, avoid full brake applications from high speeds unless an emergency arises. 2. Disconnect return spring on brake pedal. Remove shaft for brake and clutch push rod. 1. Move back seat and steering wheel up to make job easier. 4. Remove circlip and move bearing shaft toward outside until brake pedal has been run out. 1. Check all bushings and stops for clutch and brake pedals, replace if necessary. Lubricate all bearing and sliding surfaces with a multi-purpose grease. 3. The guide rod for clutch power spring has an assembly bore. Press down on clutch pedal until bore has cleared the bearing. Insert a piece of 3 mm dia. wire into bore in this position to remove force on pedal. 2. Install brake pedal with bushings. Slide in bearing shaft and install circlip. Bearing shaft can only be pushed in fully, if bearing shaft and console surfaces are aligned. 3. Remove wire in guide rod for clutch power spring. 4. Install clutch and brake push rod. Attach return spring. Check push rod play, correcting if necessary. Clutch play, see page 30 - 1 (approx. 3 mm on pedal equals approx. 0.5 mm between push rod and master cylinder piston). If there is a mechanical stop light switch, check the adjustment. 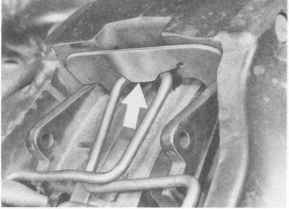 With the pedal released, the pressure rod must exert no pressure on the brake unit. With brakes bled and engine switched off, move pressure rod at brake pedal by hand to check play and assure adequate clearance at the brake unit. The minimum play is 10 mm. Adjusting l.Pull brake-pedal arm back to stop. 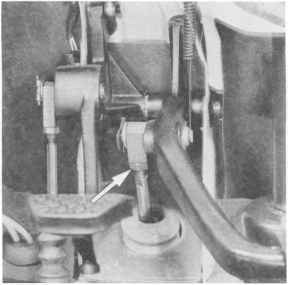 2.Slacken pressure rod locknut and adjust pressure rod until pivot pin of adapter at brake-pedal arm is slack, or until the specified play is attained (at least 10 mm at the pedal). 3.Tighten pressure rod locknut. If a mechanical stoplamp switch is fitted, check switch setting (page 46 - 10a). - brake pressure rod adapter has been removed. 1.Adjust length of brake pressure rod by turning adapter or pressure rod. Length a must be 158 + 2 mm measured from the bearing face of the brake booster on the body to the center of the adapter pivot pin. If the car has manual transmission and the brake pedal is more than 8 mm lower than the clutch pedal, correct position of brake pedal by turning pressure rod. - the pressure rod or the adapter has been turned away from its original position. The brake-pedal arm does not have a stop. 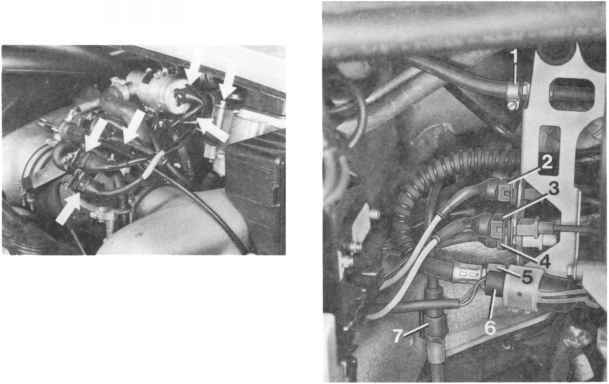 The arm is in its initial position when brake unit (brake booster + brake master cylinder) is in its released position. Since the brake pedal is unsupported in its initial position when the brake pressure rod is correctly adjusted, the permanently set clearances in the brake booster are assured. When the brakes have been bled and with the engine switched off, a pressure-rod play of approx. 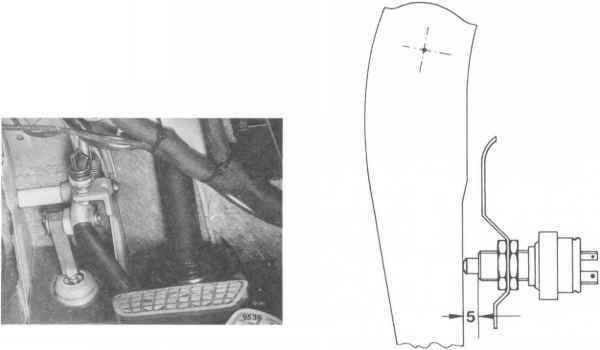 10 mm can be felt at the brake-pedal plate when the pedal is depressed by hand. 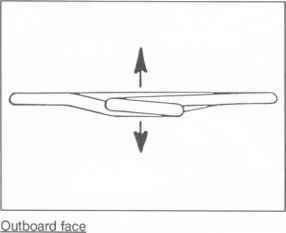 3.Check setting of stoplamp switch (page 46 - 10a). 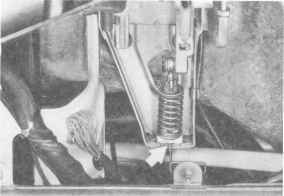 In 1984 models onward, a mechanically operated switch mounted on a bracket above the brake-pedal arm is installed as stoplamp switch. 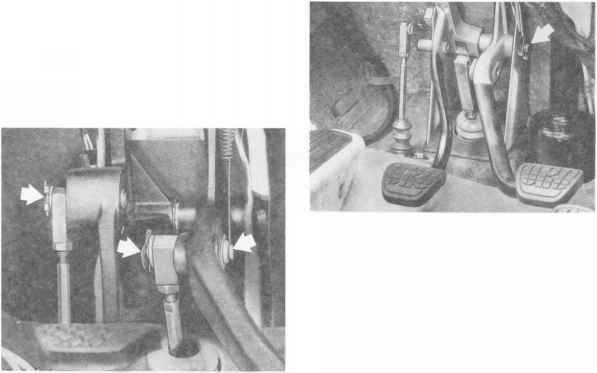 With the pedal arm against its stop (initial position), there must be a 5 mm gap between stoplamp switch and brake-pedal arm. If necessary, adjust position of stoplamp switch by turning mounting nut until the gap is as specified. Turn nuts in opposite directions (counter). 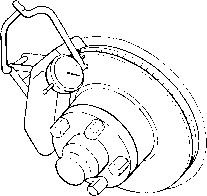 1.Remove brake caliper (do not disconnect brake hose) and place on upper control arm or attach to suitable support with a piece of wire. 2.Take off brake disk after removing countersunk bolt (s). If a brake disk is so tightly seated that light blows with a nylon-headed hammer do not move it, screw hex bolts uniformly into the two 8 mm threads of the disk and press disk off. It is possible that the bolts do not sit squarely on the lugs. A modification has been incorporated. 1.Inspect all parts and replace if there is any sign of damage. 2.Clean centering face for brake disk on wheel hub and apply a thin coat of Optimoly TA. 3.Install brake disk and brake caliper. Tighten caliper retaining bolts, torque: 85 Nm (62 ftlb). 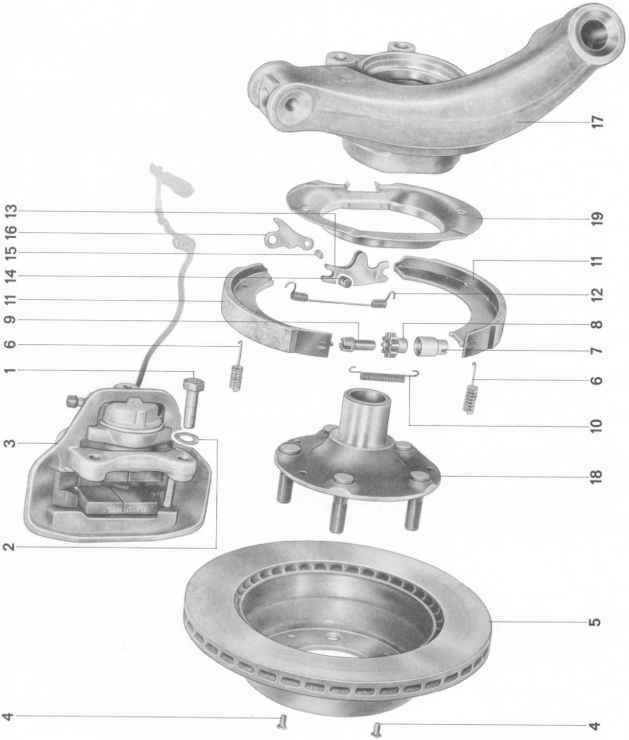 Ventilation ducts of brake disks used with floating-caliper and fixed-caliper brakes are involute: do not mix up right-hand and left-hand disks. The spare part number is inscribed on the brake disk. 1. Lubricate slack control and sliding surfaces of brake shoes lightly. 2. Install spreaders, brake shoes, return springs, springs and slack control. Install springs in correct position. 1. Disconnect floating frame caliper. 2. Turn parking brake slack control toward loosening direction. Remove brake disc after unscrewing two countersunk bolts. If a seized brake disc can't be removed even with light knocks from a plastic hammer, screw two bolts in the 8 mm tapped bores of the brake disc to press off the disc. 1. Measuring requirements: No tilt play present at wheel. If required, adjust wheel bearing clearance of front wheels. 2. Fit adapter plate (Special Tool 9510/1) to wheel hub. 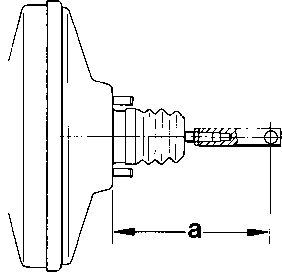 Tightening torque of wheel nuts (mounting nuts): 130 Nm. 4. Fit dial gauge with a slight preload. Place measuring pointer on maximum diameter of braking surface. 5. Rotate brake disc and read off runout on dial gauge. Max. 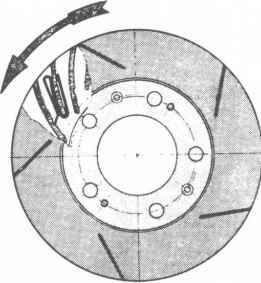 permissible runout of fitted brake disc max. 0.1 mm.